One of pyMCU handy features is the ability to read analog values - voltage in the current altered by a sensor or potentiometer - electronics that alters its resistance depending on conditions. There are photodiodes, phototransistors, photoresistors (light sensors, thermocouples and other temperature or magnetic field sensors (Hall sensor) that work in such analog way. In this article I'll show you how to read values from those sensors using pyMCU and some Python code. We can read the analog value using pymcu analogRead(PIN_NUMBER) method. PyMCU has six analog outputs (A1-A6) so we can work with up to six sensors. The method will return a value from 0-1023 range, where 0 is no voltage (like circuit not connected), while 1023 is nominal voltage (no loss on the circuit). 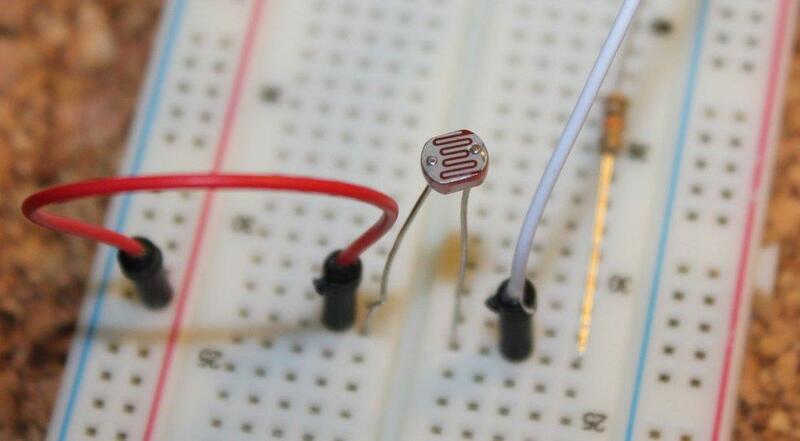 For a light sensor 0 would be dark, and 1023 bright. We connect the sensor from one side to VCC(+) and from the other one through a resistor to GND(-). Analog output measuring the value is between the sensor and the resistor. 10 kΩ worked quite nicely with my light sensors giving few hundred units change between dark and bright conditions. The temperature sensor required much lower resistance. The phototransistor L53P3BT I used is sensitive to infrared light (940 nm). Those type of transistors work when connected in reverse. Photoresistors aren't polarized and connecting them any way will give the same results. Potentiometer is not a sensor but a resistor with settable resistance. It's used in some electronic devices to set things like sound volume, fan speed or brightness. 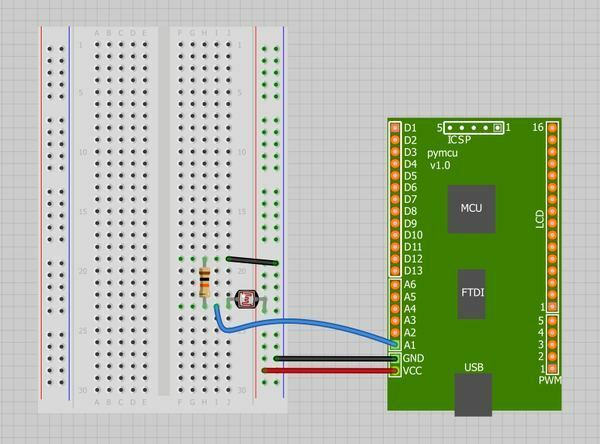 Using potentiometer is described on pyMCU website and it's bit easier than reading a sensor value, as the potentiometer provides a third pin to which we connect the analog wire. No extra resistor is needed. 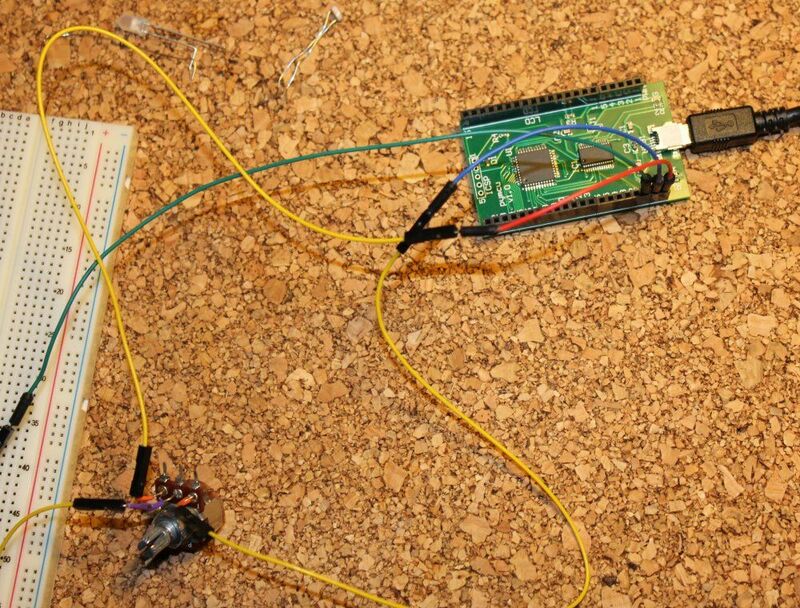 You can connect the potentiometer both ways. If connected in reverse the read values will also be reversed (like 1023 for turned of potentiometer). When using a temperature sensor you are not reading temperature in direct. To map read values to a temperature value you have to calibrate such sensor. Measure values for known temperatures and then calculate an equation (usually linear or logarithmic) describing a relation between analog value and the real temperature value. The same thing for other sensors.